Gedges Farm is a wonderful early 19th century former farmhouse just two miles from Paddock Wood in Kent. 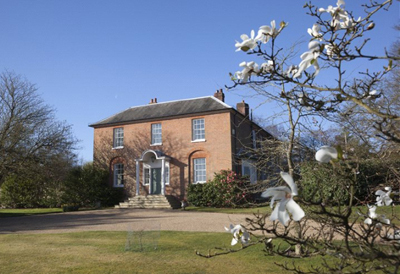 Sitting in its own wonderful grounds and listed Grade II, the house has been owned by the same family for 28 years, and sympathetically cared for in the meantime. It offers well-proportioned, light and spacious accommodation and attractive period features including grand reception rooms with fireplaces and large bay windows. Accommodation includes four original reception rooms, and a modern open plan kitchen/conservatory extension on the ground floor, while upstairs are two en-suite double bedroom, two further double bedrooms, a family bathroom and a potential self-contained annexe comprising a double bedroom, study and an en-suite bathroom. There is also a generous cellar with workshop/storeroom. Outside, the house overlooks its own mature formal gardens. These include the kitchen garden which leads through to the arboretum and then onto grassland which is interspersed with mature English oaks. An octagonal gazebo and a pavilion sit on the fringes of the formal gardens. The woodland and lakes make up around 32 acres of the property and are a haven for wildlife; three interlinked spring-fed lakes amount to some two acres. The arable pasture and orchards come to about 40 acres: 28 acres are currently sown with wheat as per an agreement with a local farmer and 12 acres are grassland for hay, while a Bramley apple orchard lies to the side of the main drive opposite the house. The outbuildings lie to the west of the main house and include a stable block and barns. There is also a detached garage. Gedges Farm is located less than a mile from the popular village of Matfield which has a pretty village green, shop and pubs. Paddock Wood station is two miles, Tonbridge 5,7 miels and Tunbridge Wells is just over six miles. The guide price is £3.5m. For further information please contact Savills on 01892 507 000 or visit www.savills.co.uk.